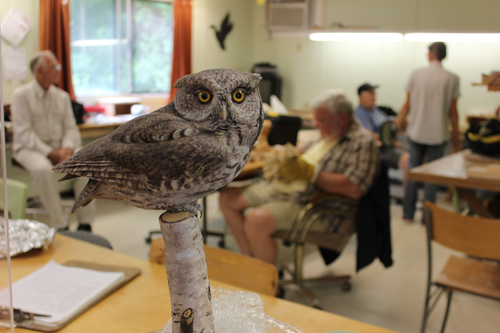 We are a diverse group of Woodcarvers who meet every Tuesday afternoon at 10 am until 5 pm and then in the evening, 7 pm until 9 pm. Our facilities are located at Wye Marsh Nature Centre located on Highway 12, Midland, Ontario. We welcome all individuals who wish to carve and have fun while learning with us. New carvers are invited to contact the Club to arrange a visit at any of our regular meeting times. No tools or materials are required at this time, but members of the Club are expected to provide their own hand tools as they progress through their carvings. The Club has a wonderful workshop, complete with band saw, power sander, dust removal system for power carvers, and air filtration system to ensure a dust free atmosphere to carve in. A club library provides a great source of reference materials and patterns, for novice to advanced carvers. 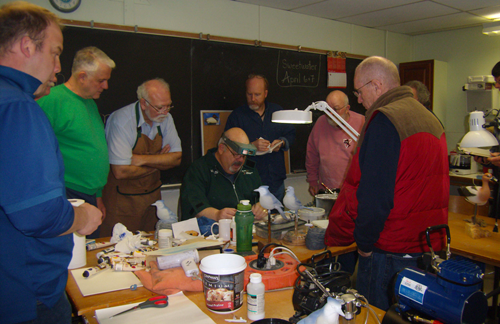 Advanced, experienced carvers provide a wealth of information and techniques to novice carvers. Become a Wye Marsh Woodcarver Today!